Mervin resides in the Oley Hills where he and his family grow vegetables and manage a small woodshop. Mervin first started working with wood at his father’s farm, Meadowview Farm, where he built trellises for the greenhouses. From there, he transitioned to building rustic log furniture and learned wood turning which has become his specialty. 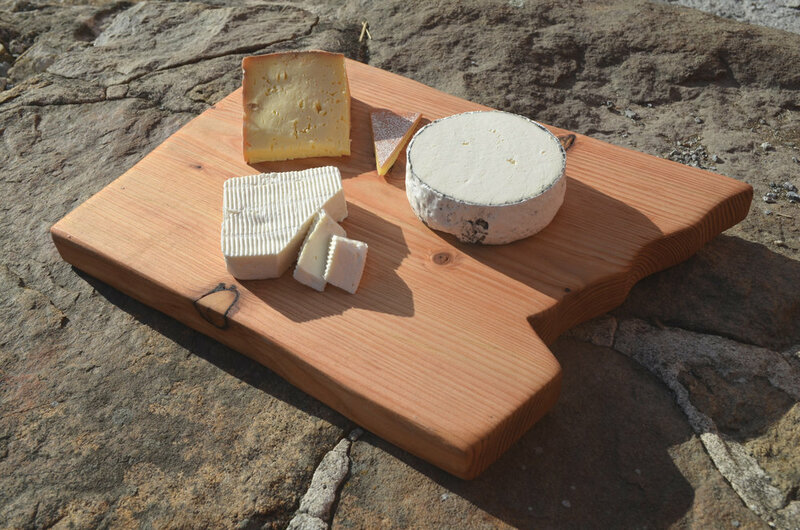 He hand-built the aging shelves at Valley Milkhouse creamery from Douglas Fir and was inspired to craft cheese boards from the same wood. Mervin’s style of carpentry follows the natural grain, curves and lines of each piece of wood to create cheese boards with character. The boards’ taller height, rosy blush color, ergonomic natural handles and optional wood-burned edging are some of their unique features. Explore cheese board styles below and contact Mervin to place an order or custom build your own. Custom boards can be made in 2-3 weeks based on your specifications. A selection is also available at the Covered Bridge Farmstand.